A nice relaxed long-form discussion about several of the topics that come up in EARTH IN HUMAN HANDS. We discuss what I call the Great Promotion: Carl Sagan used to talk about the “great demotions” of the last 400 years which showed us, through a series of scientific revelations just peripheral, and irrelevant we are in the cosmos, and how unimportant we are to the planet. And yet we are now, by suddenly realizing that we are in this new “anthropocene” age of humans as a geological force, discovering just the opposite. We are no longer peripheral. We’ve been unwittingly getting a “great promotion” to a central role in the drama playing out on Earth right now. We may not be able to handle this job, but the first step is to accept that we really are, in some ways, in control of Earth right now. To deny this is to avoid responsibility. I also discuss what I call the “anthropocene dilemma” that arises when a species has planet-changing technology but no global system of awarness and control of the effects of this technology. And I give some examples that suggests we have the capacity to overcome this dilemma and develop the capacity to make intelligent global decisions about how to deploy technology for the betterment of our civilization, of other species and of the biosphere as a whole. We discuss SETI and its connection to ideas about our own potential longevity as a civilizaiton with planet-altering technology. Can a civilization with planet-changing powers, develop a sustainable long-lived presence? And we discuss the asinine story that the new president intends to direct NASA to abandon research into Earth science and just focus on outer space. This can’t happen and here I say why. These topics and more were covered in this enjoyable conversation. Paul Gilster’s Centauri Dreams is one of the most knowledgable and interesting places to find commentary and discussion of topics related to space exploration, SETI and humanity’s future in space. Here, in a three-part series of blog posts, he discusses EARTH IN HUMAN HANDS and in particular my treatment of SETI and how it relates to visions and challenges of our own future here on Earth, how we might find ET civilizations who have survived their own version of the Anthropocene, and how visions of our sustainable future dovetail with ideas about interstellar travel and communication. I love it when somebody reads my book and seems to really get it! Part 1: SETI in the Anthropocene. Part 3: The Starship in our Future. 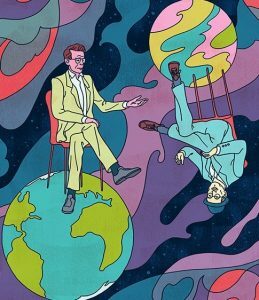 Here’s Me & Kim Stanley Robinson Sitting on some Planets & Talking about How to Survive the Anthropocene. An Astrobiologist Asks a Sci-fi Novelist How to Survive the Anthropocene. Advance Review: Daily Kos raves about EARTH IN HUMAN HANDS! 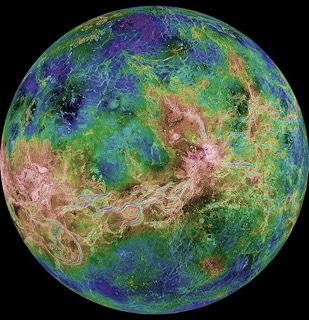 My new article in Nautilus, about our quest to know Venus, which may have for a long time been the other biosphere in our Solar System. We need new missions there! Here I’m Interviewed by UpportunityU about Science, Life and my Book! Ron Sparkman, from UpportunityU interviews me over Skype about astrobiology, climate change, what to do if you want to study science, the human future, and EARTH IN HUMAN HANDS. Thank Our Lucky Planets: How Planets Really Do Shape Our Fate. Human history has always been linked to the influence of distant orbits, from climate change (past and present) to our exploration of the solar system. My newest Cosmic Relief Column in Sky & Telescope Magazine discusses how the orbits of the planets really have controlled our lives. Astrobiological view might help us save planet: Nice write up of EARTH IN HUMAN HANDS in the Register Guard.